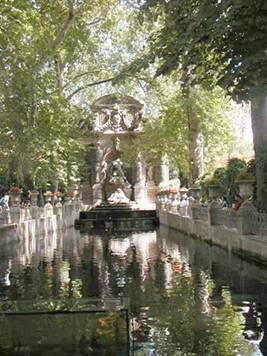 Every summer, there is a new piece of public art at the end of the pool for the Medici Fountain in the Luxembourg Gardens. This year, the display here features plastic recyclables in an aquarium. 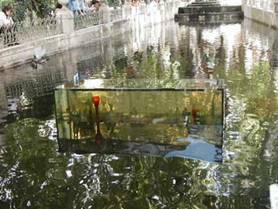 The company responsible for maintenance and installation of this aquatic artwork is called Anicash. I decided that this must be a very low-tech company. See how they affixed the sign’s post to the lovely metal fence around the fountain’s pool (below). 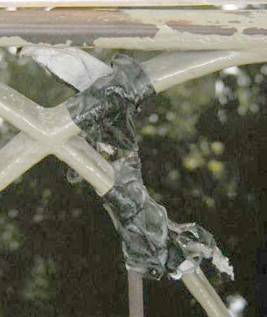 I call this “frengineering.” They used black duct tape, applied badly. 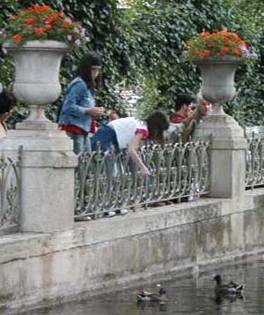 Girls feeding ducks in the Medici Fountain. Yesterday was Sunday, and today is the Feast of the Assumption, the two slowest days of this year in Paris. So slow, in fact, that for the first time ever, the authorities allowed a movie crew to film a scene on the peripherique yesterday. The peripherique is the major highway that circles Paris. The section that was closed for the film crew was on the north side of the city. In the past, the authorities have only allowed this kind of closing in the middle of the night. But yesterday, moviemaker Guillame Canet had several hours in the middle of the day to shoot acter François Cluzet crossing many lanes of traffic on foot. Don’t try this at home. The movie is Ne le dis à personne, based on the American novel Tell No One by Harlan Coben. Last year, the Feast of the Assumption fell on a Sunday. As I recall, the open market under the tracks on boulevard de Grenelle was open as usual on a Sunday, although with far fewer vendors and shoppers. And that meant that the newpaper kiosque was open that day. It normally closes on Monday so that it can be open on Sunday. That kiosque is the only one around here that I know is open on Sunday, and it is where I always go on that day to buy the three newspapers we read every day. I knew that buying the papers today, Monday, would be a challenge because the Grenelle kiosque would most likely be closed as usual on Monday, and that many other kiosques would be closed because it is the Feast of the Assumption. But I ASSUMED that, in orderly Parisian fashion, certainly some kiosque would be open somewhere near here. Oh, did I ever have to search. I started north on Commerce. Kiosque on Emile Zola, closed, as expected. Kiosque at Grenelle marketplace, closed, as expected. Two other nearby kiosques, closed. Surely the kiosque at Cambronne would be open, I reasoned. It usually is. So I hoofed it over to Cambronne. Closed. Well, then I remembered that when Tom was robbed in 2000 (or was it 2001?) I was looking at a newstand in the La Motte Picquet métro station while he bought tickets. A creep loitering at the newstand was watching us and he saw exactly where Tom put his wallet. I went down into the station, and of course that newstand is not there anymore. I hope it was eliminated for security reasons. It gave creeps an excuse for loitering and picking out potential victims in the métro. I was starting to wonder if, even when I found a newstand or kiosque, there would be any newspapers left. In particular, the American paper, the International Herald Tribune (owned by the New York Times), is known to sell out sometimes before noon. Back on the street again, I decided to walk way over to Place Charles Michel. There is a kiosque there, which I reasoned would be closed, but there is also a little store selling newpapers and magazines, right next to the McDonalds. I hoped, since it seemed to be a busy little shop near a busy spot, that it would be open. Hooray! It was! I bought the papers! They had PLENTY of International Herald Tribunes! I’d arrived there just in time. When I left the shop, a line of people was forming that would surely soon string out onto the pavement of the Place. Then I was so curious about this phenomenon that I decided to walk home in a slightly indirect way so that I could see if a similar, but smaller, shop near avenue Felix Faure and rue des Entrepreneurs was open. It was not. And our favorite brasserie near there, across from the church, also remains closed for vacation. Sob. The church, however, was open. After rounding the corner onto the rue du Commerce, I walked past the kiosque that we usually use on weekdays when I want to pick up supplies at the little but nice supermarket called G20. It was closed. By the time I returned to the apartment, it had taken an hour to run this silly errand! There were almost no cars on the street this morning. And the few pedestrians I saw were rushing to someplace (church?) or commiserating with each other about how difficult it was to find a place to buy a newspaper. This afternoon is a bit livelier. I do miss our favorite restaurants. A couple of them, like l’Epopee and Oh! Duo will open before we go home to the US. I especially miss Madame Valero at Oh! Duo. I remember speaking with her about the loss of the 2012 Olympic games to London. She concluded that the reason Paris was not selected was that they were not good at “lobbying.” We heard the word “lobbying” a couple of other times, one of those English words that seems to be allowable in the French language. Could it be, I wondered, that the French don’t even have a word of their own for “lobbying”? Might that account for this weakness that Madame Valero alleges? We looked up “lobbying” in the English side of the French/English dictionary (Bantam’s New College edition). The French definition for this English word is “intrigues de couloir” (intrigues in the hallway). No wonder they’re having trouble with this concept. I looked up the noun, “lobby,” in the French dictionary (Le Robert Micro). It gives the definition “groupe de pression.” That is a bit closer to the real thing. But I think that Madame Valero may be right; the French need to learn how to lobby.